The forecast was a very long way from ideal for our trip to Energylandia, with a predicted high of just eight degrees celsius and a one hundred percent chance of rain showing from mid-morning onwards. Given that we made a special effort to get to the park for opening in the hope of making it through the coasters before the weather closed in, and though we lost the race it didn't actually matter, as the only ride affected by the conditions was the powered coaster. We managed to score a complete circuit on it (after a fashion...) in the nick of time thanks to a particularly benevolent ride operator who ran to his control booth to save a few precious seconds. 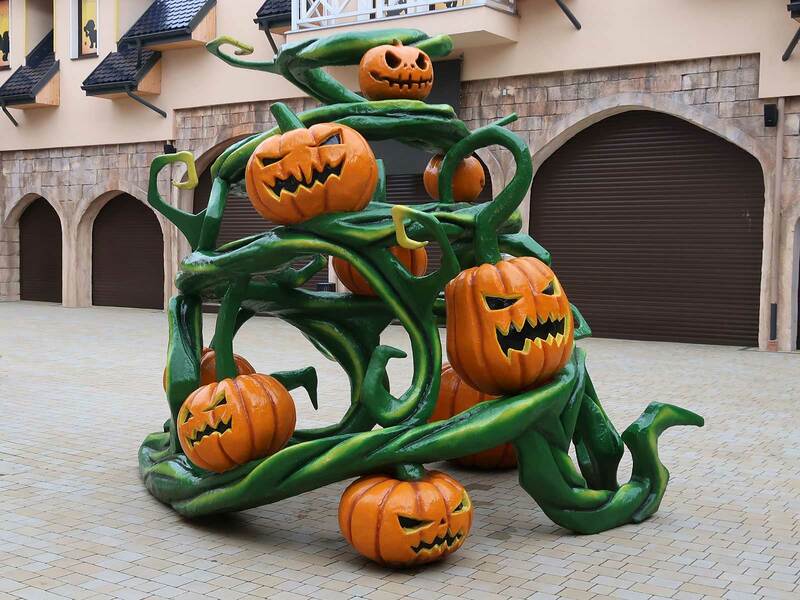 Before writing about our day I'd like to comment briefly on the obvious effort (and money) spent to decorate Poland's newest park for Halloween. Several thousand pumpkins would probably have had the desired effect on their own, but these were just part of the additional theming, which included blood-soaked mannequins, fiberglass ghosts, tombstones, and subtle overlays on top of existing facilities, such as witches on broomsticks painted onto the side of buildings. Even the park map had been reprinted with seasonally adjusted imagery. The presentation was not as refined as that of Europa Park, but far in excess of what I'd have expected to see from a park that only opened its gates three years ago. 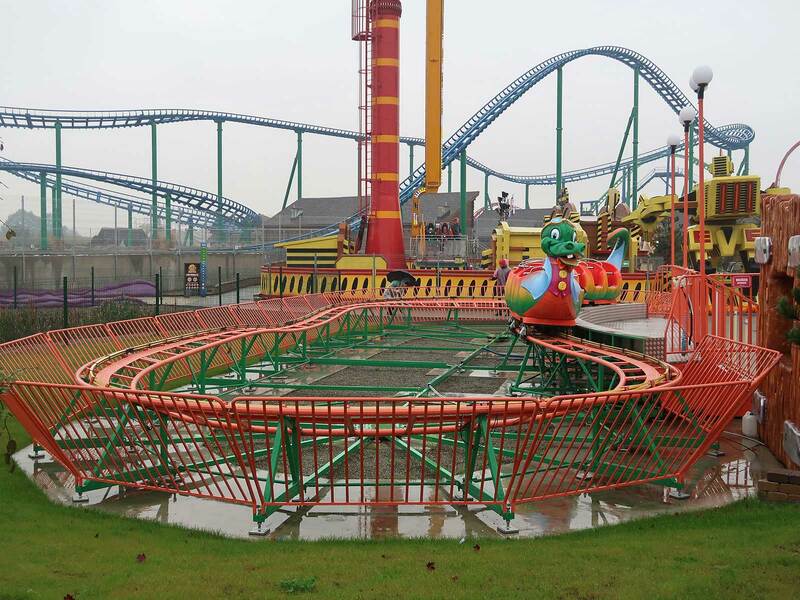 Our first stop was at Boomerang (#2394), the eighth installation of the Vekoma Family Boomerang and the second example of the so-called Rebound model introduced at Paultons Park last year. We were the first guests of the day into the queue, and with the whole train available to us we decided to select the front seats, giving us a pleasing view of track to admire while we waited for more patrons to arrive. After around ten minutes the operators apparently realised that a full train wasn't likely to happen any time soon, and rose from their respective positions for a quick restraint check before sending us on our way. The ride begins with a gentle tyre drive lift that pulls the train backwards to a height of twenty-three metres. There is a three second long pause at the apex before a brake is released and the train accelerates to its top speed of sixty kilometres per hour. A full speed journey through the boarding station is followed by a climbing left turn, a descending right turn, and a spike that passes through what looks very much like a garden shed on stilts. The train then completes the same journey in reverse. The experience is not aggressive in any way, and can be thought of as what one might get if a backwards section was added to an upgraded roller skater; in short it is the perfect family coaster and a superb addition to any park. We'd hoped to experience the first Space Warp Launch Coaster from Vekoma when we visited the park last year, but we were too early; at the time the station lacked a roof and there were no trains on site. It was six weeks after our trip when the ride premiered to universal acclaim, a rare accolade indeed in a world filled with enthusiasts who can rarely agree on anything. My already considerable interest in the new coaster was piqued all the more when I learned that the original queue had proved woefully inadequate for demand, forcing the construction of a much longer routing along the eastern side of the ride that was linked with the existing space via a pathway underneath the second inversion. Formula (#2395) uses the same basic rolling stock as Lech Coaster, albeit with four cars per train rather than five. The ride begins with a slow turn out of the station into an enclosed launch tunnel lined with life size models of racing drivers. The train comes to a stop as a dry ice machine sprays a thick cloud obscuring the outside from view, and a klaxon sounds. The acceleration when it happens is smooth and quick, though it's worth noting that the top speed attained isn't close to the "over 100km/h" suggest by the official park web site. That speed would result in a ridiculously intense traversal of the twenty-five metre high sidewinder inversion, yet the train rolls through its apex at little more than walking pace with a superb moment of hangtime. The remainder of the layout features two corkscrews, three airtime hills, and several powerful turns that are negotiated without even a hint of jarring. The result is a fabulous ride, if a short one lasting just thirty seconds from launch to brakes. There was the faint hint of moisture in the air as we disembarked and began power walking towards our two remaining targets. We made it to within feet of the powered Circus Coaster when rain began to fall in earnest. The lone operator saw us approaching, and motioned that we should get on board the train as quickly as we possibly could. He hit the dispatch button within seconds of us taking our seats, and though the noise from the wheel mechanisms wasn't promising we nevertheless rolled out of the station of a speed of about half a mile per hour. A tiny airtime hill half way round the course was sufficient to bring us to an unceremonious halt, but the operator stopped and started the power a few times, each time moving us a little bit further. Eventually we were back in the station, where a very heartfelt shrug made it clear that he'd tried his best. Though we may not have experienced what the ride is capable of we did manage at least make it all the way around the track, which should be sufficient for those who count powered coasters. The screech of slipping rubber tyres was if anything even more prominent on Happy Loops (#2396), though the ride still managed to clatter its way around the extended compact spinning layout with the usual complete lack of finesse. That said, Unhappy Loops might have been a better name today thanks to a huge quantity of water in the seats that it wasn't feasible to clear. Both of us ended up quite wet, though nowhere near as wet as we might have been after riding Speed, the allegedly-new-for-2017 Intamin water coaster, which we'd seen promoted heavily on billboards during our drive to the park. Fortunately the ride in question was clearly unfinished, with construction still underway in the station and temporary fencing in front of the entrance. This was in many ways a relief, as it allowed us to sidestep some very hard questions about just how badly we wanted a coaster credit. Instead we we were able to make our way to the warmth and comparative serenity of Monster Attack, an eminently forgettable target shooter located right in the middle of the park. The queue was the longest of the day as many others sought to dodge the weather, but it remained disciplined and in due course we were allowed inside. The ride has a fleet of eleven cars that are loaded and dispatched together. Number three was out of service today, though apparently there was no mechanism for removing it from the track as a wet floor sign had been attached to it with cable ties. Megan's gun was faulty, and after about fifteen seconds of failing to hit anything she holstered it so that she could pay more attention to the scenery. This wasn't a particularly good thing, as it revealed the fact that the static models were for the most part crudely painted plywood cutouts. On our last trip to the park the best ride by some margin was Dragon Roller Coaster, and the suspended family coaster remains one of the highlights of any visit. Readers should be aware however that the back seat is now being used for VR rides, a decision best described as bizarre; it would seem more sensible to pick the middle rows of a not-terribly-good ride (of which the park has several!) rather than what are arguably the best seats on a great one. Fortunately the equipment was nowhere in sight today, perhaps due to the weather, allowing us to enjoy the experience as the designers intended, and we certainly did; the first drop in particular was absolutely superb. We subsequently went back for two more laps, both of which were great. We completed several more laps on Formula and a back seat on Boomerang before heading to Atlantis, the river rapids ride that I described last year as "unintentionally hilarious". The experience this year was for the most part as it was, though there was one significant alteration; the lift at the end of the course had been retrofitted with red and white poles above it, presumably to stop anyone who might attempt to stand up. As an additional failsafe, an operator was stationed alongside a new control panel with a bright red emergency stop button. One presumes that these changes were made in response to the tragic accident at Dreamworld in October 2016 when several guests were killed after a boat became stuck in the machinery. One of the seventeen new attractions at the park this year (!) 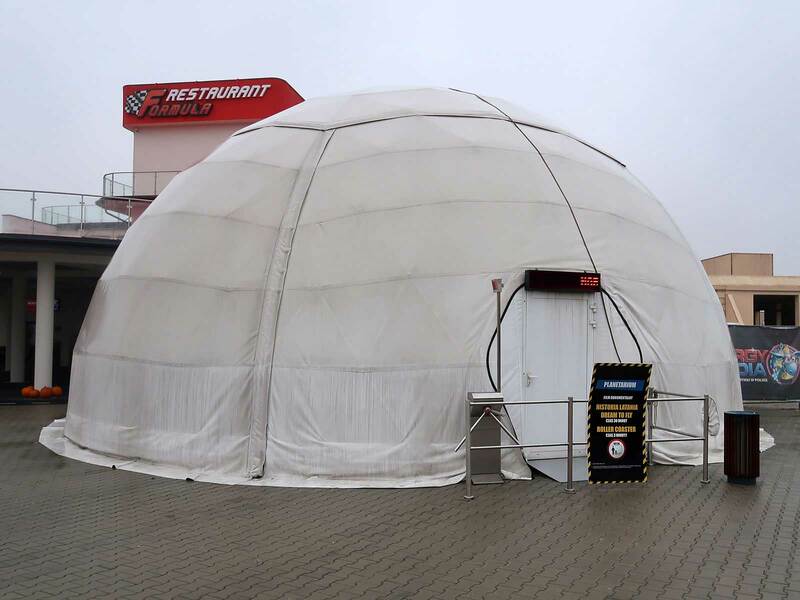 is a panoramic theatre built inside an igloo-shaped tent. We found ourselves right next to it just as a show was starting, and decided that a few minutes in heated comfort would be good. The performance turned out to be a half hour long documentary in Polish (without subtitles) on the history of flight, but our existing knowledge of the subject allowed us to interpolate much of the narration for ourselves while admiring at the pictures. The footage started out with flight as portrayed by ancient mythology, then progressed onto Leonardo Da Vinci, hot air balloons, and early attempts at airplanes. Otto Lilienthal and the Wright Brothers came next, followed by famous early pilots such as Charles Lindbergh and Amelia Earhart. There was a brief interlude showing aerial battles during the wars, all of which were accompanied by sad-sounding choir music, before the performance concluded with space flight and close-up footage of a Dreamliner and of the Udvar-Hazy Center in the United States. It would have been possible for us to complete a clean sweep of the park's roller coasters today, but we decided that there was no need for us to suffer the SLC, endure the horrendously awful SBF mouse, or indeed waste time on the perfectly respectable but we've already got the credit Wacky Worm. We did however go for a back seat on Energu&sacute; Roller Coaster, followed in short order by the Mars Roller Coaster which looked very different to how it had in 2016; the relatively plain red platforms (which I'd said nice things about) had been filled with all manner of alien life and even a spaceship that was somehow smaller than the very creatures it was designed to contain.